Well I guess I cannot photograph lasagna, every shot I took looked like a pile of crap, and would not do this goodness any justice. 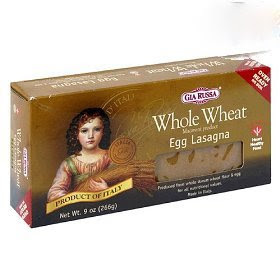 So instead, here is a picture of the lasagna noodles I used. This post is for Miss Allie, who called me out the other night for not updating my blog. The story behind that is I have not been up to cooking lately due to the whole pregnancy thing. For a while nothing sounded good, so Abe just did a lot of grilling, hence no posts. I am now in my second trimester, so I think I'm all clear on the nausea thing. So Allie this one is for you. I made a half recipe of this lasagna, which was plenty for 3. Preheat oven to 400 degrees. Spray a 9X13 glass baking dish with a nonstick spray. In a medium bowl combine: ricotta, mozzarella, Parm, eggs, and parsley; set aside. In a large skillet, heat olive oil and saute garlic; add zucchini, mushrooms, and gently saute for 2-3 minutes. ( Do not over cook veggies, they will get to soggy) Set aside. Remove Lasagna from box, DO NOT BOIL. To assemble, cover bottom of pan with 6-7 oz. of sauce. Layer 4 uncooked noodles, 1/3 of the ricotta mixture, 1/3 of the vegetables, and 1/3 of the spinach. Drizzle with 6-7 oz. of sauce over the vegetables. Create the next layer beginning with the pasta sheets. Gently press down each layer until completed. Repeat layering until you have created 4 layers. Top with 6-7 oz. of sauce. Cover and bake for 45-50 minutes, covered with foil. Remove from oven and let stand for 15-20 minutes before cutting and serving. This crisp, creamy salad is my answer to coleslaw and is a great companion for most grilled meals. I made this with the spice rubbed pork tenderloin, but would be great with burgers or fish sandwiches. I got this recipe from Cooking Light, of course. Oh yea, and use a food processor for the prep.....you will be very happy. Combine first 3 ingredients in a large bowl. Combine vinegar and remaining ingredients in a small bowl; stir well with a whisk. Add mustard to mixture to cabbage mixture, and toss well to coat. Cover and chill 20 minutes. Stir before serving. Yield: 7 servings. THE Verdict: FAB!! Great side dish. Add a dash of hot sauce to the mustard mixture for extra spiciness. Yet another fab cooking light summer recipe. This is a must make for the summer. My mom and I made this together while I was home over the month of June. The BBQ sauce is so good, I would almost make a double batch and save for other grilling expeditions. To prepare sauce, cook bacon in a medium sauce an over medium high heat for 4 minutes or until almost crisp. Add onion to pan; cook 4 minutes, stirring frequently. Add mustard and next 5 ingredients to pan, and bring to boil. Reduce heat, and simmer 4 minutes until slightly thick, stirring occasionally. To prepare pork, combine brown sugar and next 7 ingredients in a small bowl, stirring well; rub mixture evenly over pork. Place pork on grill rack coated with cooking spray. Grill 20 minutes or until a thermometer reads 155 degrees, turning once. Let pork stand 10 minutes. Cut pork crosswise into 1/2 inch thick slices. Serve with sauce. THE VERDICT: A winner in the pork tenderloin division. The bacon's savor is key to the sweet tart sauce. These are so good. They are a great alternative to desert, they are pretty sweet, so I wouldn't recommend them for breakfast. The best part.... They are filled with all kinds of healthy ingredients. Each muffin has 3 grams of fiber, 5 grams of protein, and omega 3's, so bring on the post workout snack or late night sweet snack. Preheat oven to 350. Line a 12 cup muffin tin with paper liners. Coat liners with cooking spray and set aside. Measure out the flours, leveling with a knife, into a large mixing bowl along with the brown sugar, flax seed, 1 T. cocoa powder, baking soda, salt, and chocolate chips. Whisk together until combined. Combine yogurt, bananas, egg, vanilla, oil, and milk in a separate bowl until thoroughly mixed. Fold banana mixture into the dry mixture just until combined. If using peanut butter, fill the prepared muffin cup 1/2 full with batter and then spoon 1 tsp. peanut butter on top. Fill the cups with more batter until 3/4 full. (if not using peanut butter simply fill cups with batter 3/4 full) Sprinkle tops with wheat germ and put in oven for 20 minutes or until tops of muffins look dry and spring back when touched in the center. Allow to cool. THE VERDICT: I could eat the whole batch of these. The peanut butter really makes it, so include it. Anyone else feel like I do and cannot eat one more hamburger or brat. My body is craving veggies, so you can imagine the boys were surprised to come home to a huge pot of veggie soup. I was already prepared for the, "where's the meat?" question. But it never came. Have they become veggie lovers? Not quite! But they each had a huge bowl. The one great thing about this recipe is that it makes quite a bit, so you can freeze leftovers. I scooped about 2 cups in freezer bags, and lay them flat in the freezer. They are gonna make great lunches in the next coupe weeks. In a dutch oven, heat oil over medium heat. Add onion; season with salt and pepper. Cook stirring frequently, until onion is translucent, 3 to 5 minutes. Add broth and 2 cups of water; bring to a boil. Add zucchini, green beans, corn, tomatoes (with juice), and orzo; cook uncovered, until orzo is tender, 8 to 11 minutes. Season with salt and pepper. THE VERDICT: Quick and easy to throw together, and chock full of good summer produce. If freezing, thaw before you reheat it. ENJOY!! My mom and I made this while I was at home in June. This is just a souped up version of Mac and cheese and boy is it good. I had all intentions of making this for my fam, but a bout of nausea came over me and my mom had to take over. Thanks mom. This is a cooking light recipe from July 2008. Hope you enjoy!! Cook pasta in boiling water 5 minutes; drain. Remove casing from sausages. Heat a large non stick skillet over medium-high heat. Coat pan with cooking spray. Add sausage to pan ; cook until browned, stirring to crumble. Remove from pan. Heat oil in pan. Add zucchini, onion, salt, pepper and garlic. Cook 10 minutes or until veggies are tender, stirring occasionally. Combine broth and flour in a small bowl, stirring with a whisk. Add broth mixture to pan; cook 1 minute. Combine zucchini mixture, pasta, sausage, and feta cheese in a large bowl; toss well. Spoon pasta mixture into an 11x7 inch baking dish coated with cooking spray. Sprinkle evenly with mozzarella cheese. Bake at 400 for 20 minutes or until bubbly an lightly browned. Yield 6 servings. THE VERDICT: Perfect comfort food with some added vitamins from the zucchini. This is a great recipe for using up pantry items and produce. So sorry I have been gone!!!! I just got back from my month long trip to MI, and its back to the blog. So I was all ready to put a bunch of recipes on here, then I realized I left my camera cord in MI.....oops....Ok gotta get ahold of my mom and have her send it. I promise their will be posts soon.